A couple of years ago I learned of an announcement by Tokyo Electric Power (TEPCO) and Tombow Pencil that together they had developed recycled mechanical pencil leads made from the worn out generator brushes of TEPCO’s power plants. Generator brushes are made from high purity graphite, and worn ones are normally sent to the local dump. However, in this new recycling process they will instead be crushed to powder and reformed as mechanical pencil leads. Something like 300kg a year of brushes are normally replaced, apparently enough to make about 24 million sticks of refill lead. Well, heck of an idea, and a great marketing point I’m sure, but a bit debatable if this would make any difference to the global environment. Some other marketing ploys also spring to mind - your local nuclear power plant is chock full of graphite rods, they’re one of the things keeping it from going “kaboom” - so lots of possibilities there for making recycled 'glow in the dark' pencil leads, etc. I suppose these last few sentences have now got me on some CIA database. 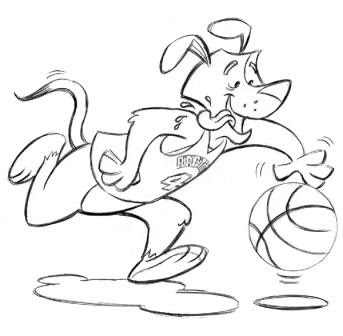 Anyway, back to the point at hand. When my Pilot Rexgrip BegreeN mechanical pencil arrived, there were a couple of containers of BegreeN refill leads with it. 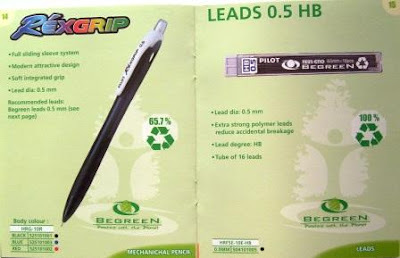 To be honest, I was actually looking forward to the BegreeN leads more than I was to the Rexgrip pencil itself. So, here they are, Pilot Neox-Eno BegreeN Leads 0.5mm HB grade. 100% recycled. Well that’s when I started thinking. 100% Recycled? 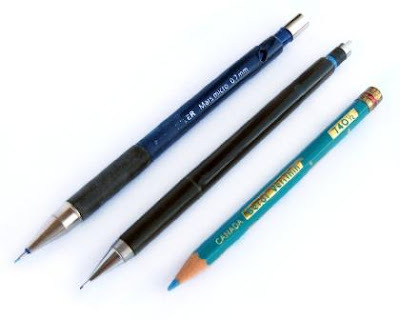 Initially I was thinking they were made from recycled graphite, like the TEPCO-Tombow venture. But the Neox-Eno label on them raised my suspicions – were these really just ordinary Pilot leads and it was the container that was recycled? So, time to ask Pilot for the answer – are the leads recycled, or the container, or both? Well, the answer is that it’s the container. The container is 100% recycled, the leads are just ordinary Pilot leads. They have now updated their website to change the claim from 100% Recycled to 98.1% Recycled, meaning that 1.9% of the weight of a container full of leads is the leads (0% recycled themselves) and 98.1% of the weight is the container, which itself is 100% recycled. Well, call me a pedantic picky sort of guy, but quite frankly I think the correct statement is 0% recycled. The leads are the product and the container is packaging, so the product is 0% recycled. They don’t make any statement or calculation about the recycled status of the boxes they supply their other BegreeN products in, so why should it be different for leads? In a purist view, I think a little container for a dozen leads is surely a huge waste, an example of excessive packaging – you could get 50+ leads in the BegreeN container, thus reducing plastic use, and overall that would probably be more “green” than their current product offering. Maybe a biodegradable cardboard container from unbleached pulp? Lots of possibilities. OK, no need to go overboard here, this is just pencil leads, utterly insignificant in the big picture of the state of the world environment. But still, it does show how things are open to interpretation. So, good on Pilot for wanting to improve their environmental impact, but you still need to keep your eyes open when it comes to the claims people make about their products. 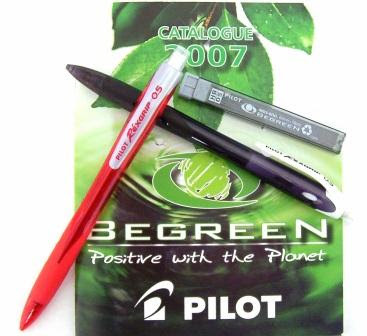 Pilot BegreeN leads – only available in HB grade and 0.5mm, to suit the Rexgrip BegreeN mechanical pencil. Since these BegreeN leads aren’t any different from normal leads I’m not actually reviewing them as part of this particular post, that’s something for the future. Disclaimer: Like my Pilot Rexgrip BegreeN mechanical pencil, the BegreeN leads were given to me free of charge by Cult Pens in the UK. Well this is another one from my “Japanese Sampler”, another one I have never seen before. It’s a multi-pen, but the tips are 0.3mm, 0.5mm and 0.7mm pencil. The tip selector system is a basic set of three slider buttons. 0.3, 0.5 and 0.7 are printed on the top of the end cap of the pencil, by the slider in question. So, up at the top of the pencil there are the three black slider buttons, and you simply slide one down and the relevant pencil tip is propelled out ready for use. 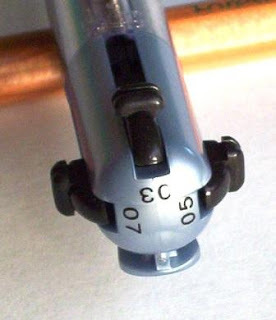 Down on the clear section of the body in the middle of the pencil, a black printed dotted line extends down from the slider and is labelled as “0.7 sharp”, “0.5 sharp” or “0.3 sharp” as appropriate. In a thoughtful touch, the width of the printed lines also varies, so the “0.7 sharp” printed line is much wider than the “0.3 sharp line. Sharp is of course the Japanese term for mechanical pencil. Once the chosen tip is extended out, you “click” the slider button down to operate the ratchet lead advance mechanism. To retract the tip back inside the pencil body you partially slide one of the other two slider buttons down and this triggers the spring loaded retraction mechanism. The grip is slightly contoured, but its rather smooth and slippery feeling. It’s quite a lightweight pencil overall. I’m not sure of the price of this pencil, but being a lightweight plastic Pentel it obviously won’t bust the bank, and would be an awful lot cheaper than something like a Rotring Trio or a Platinum multi pencil. Now if only they could get a fourth pencil inside there, the 357+20? Firstly, whats the difference between these two mechanical pencils, the Rexgrip and the Rexgrip BegreeN? Visually, the answer is nothing. They are the same. The difference is that the Rexgrip BegreeN is from Pilots ‘green’ environmental range, and the Rexgrip is from their ordinary range. They are the exact same pencil, just the materials and/or manufacturing process of the BegreeN version supposedly make it better for the environment. The Rexgrip is apparently only available in 0.5mm lead, which is a little unusual by todays standards. It’s an all-plastic body, so is quite lightweight as you would expect. 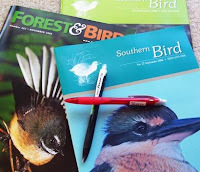 It comes in a small selection of transparent colours, my red one is a nice bright colour scheme. You can see inside the body with some back-lighting. I’m not totally happy with the look of the rubber grip section though. It is smoothly integrated into the contour of the body, but it has some little cut-out sections in it which I find a little annoying when “under the finger”. I basically don’t like such discontinuities. The rubber grip itself is a fairly hard compound so there is little to no cushioning effect. There is a small amount of extra grip from the compound, but nothing spectacular. Pilot state the Rexgrip has a “soft integrated grip”, well if that’s their idea of soft, then they would have to call many other manufacturers grips an “extra super mega soft grip”. Moulded into the body in small letters is “Pilot Japan” so one assumes they are made in Japan. The Rexgrip uses a standard push top ratchet mechanism, 10 clicks advances 6mm of lead. The short metal sleeve is retractable for pocket safety. There is a small eraser under the clear top cap. It is 14mm x Ø5mm, but because of the housing, only about 5 mm of length is easily usable. The pocket clip is in a contrasting colour, and is a reasonably good one for a basic plastic clip. “Pilot Rexgrip 0.5” is printed on the clip. Overall I haven’t got much to say about the Rexgrip. It strikes me as just an ordinary everyday economy grade pencil. It’s a good pencil, there’s nothing particularly wrong with it, it’s just there’s nothing particularly noteworthy about it either. Best Points – I quite like the look and colour scheme. Not So Good Points – The metal lead sleeve sometimes doesn’t retract 100% back into the tip. 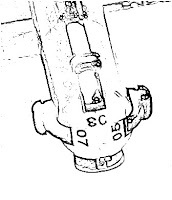 Dimensions – Length 147mm, diameter 10mm at grip section. Balance point about 80mm up from the tip. Right, well, that’s the pencil as a pencil. Up above I said “…it’s just there’s nothing particularly noteworthy about it either.” Well, that’s not quite the case for the Rexgrip BegreeN, since it is claiming “green environmentalness”, and all those warm fuzzies you get by association. So, what exactly are the environmental credentials of the Rexgrip BegreeN? 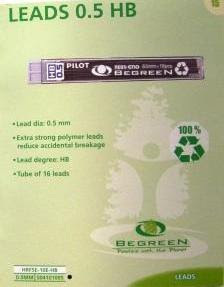 According to Pilots literature, the BegreeN range of products are made from recycled materials. 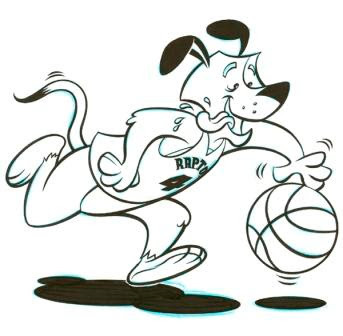 To be more specific, the claim is that 100% of the plastic content of the item is recycled, so Pilot state 65.7% recycled for the Rexgrip BegreeN, meaning the recycled plastic parts make 65.7% of the pencil by weight, and the other 34.3% of the pencil is non-recycled metal, eraser and other non-plastic componentry. Furthermore, Pilots operations are certified to an ISO 14001 Environmental Management System by the Japanese Standards Association, to give us some independent verification of their claims. What does all this environmental stuff actually mean? Well the cynic in me is always suspicious, but this does mean something, probably something good. But these things are so complicated, it’s hard to get to “the truth”. People with vested interests create all sorts of smokescreens and scams and dress them up in an “environmental” label to try and hide the fact they are just spinning us. A current example would be the “Food Miles” thing – absolute bogus nonsense wrapped in a smokescreen of science and environmentalism. Long-time readers of this blog might have picked up on a hint of “Greenie” about me. It’s true, I do consider myself a bit of a greenie. We inherently want to believe that recycled plastic is better environmentally than new virgin material made from oil. But it’s often not quite that easy. Think of the carbon emissions from all those trucks operating suburban curbside recycling schemes. You put your plastic out on rubbish day, a truck (diesel powered) collects it, it eventually ends up at a processing plant and is turned into recycled plastic moulding material (using electricity generated by… coal/gas/oil fired power station?). All this assumes its locally recycled as well. What if your recycled plastic is actually exported to the third world somewhere for processing and then shipped back? I’m not saying this happens in this case, or that recycled isn’t best, I’m just saying there can be more to it than just “Recycled = Better than Not Recycled”. Back in the 1980’s when I specified what plastic materials my companies products were moulded from, I was keen to use recycled material, but it was more expensive than virgin material! 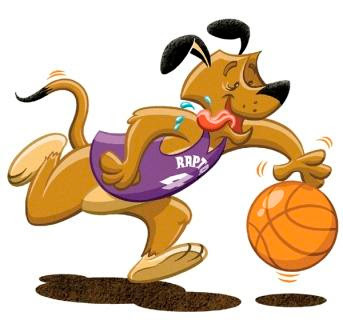 To add insult to injury, recycled material also had inferior properties, wasn’t certified for food contact, and so on. A lot of advances have been made with recycled material, the price of virgin vs recycled material has changed, so things are different these days, but still, I take all “recycled” scenarios with a grain of salt. Things are not always what they seem. As I say, I’m a cynic, but nevertheless I commend Pilot for their BegreeN range. And we can have some confidence in their claims because of their independent certification by the Japanese Standards Association. Obviously they have done this because of commercial interest, but that doesn’t mean it isn’t the right thing to do. Footnote: Coming soon, some words on Pilot BegreeN 0.5mm Leads. Disclaimer (and Free Advertisement? ): My Rexgrip BegreeN (but not ordinary Rexgrip) was given to me free of charge by Cult Pens in the UK. Lots of people on the environmental bandwagon these days. 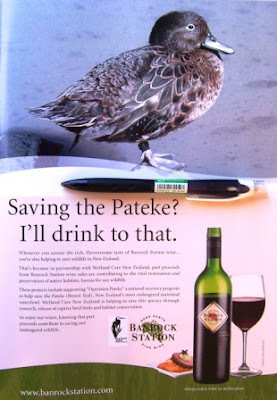 Here's some Australians trying to get us New Zealanders to buy their wine and they will donate some money to help save endangered NZ birds and habitats.